Often when we are seeing plant profiles, we come across words like plant is hardy to Zone X. This information is useful in a sense that it tells us what minimum temperature/climate, a plant can tolerate. Therefore one must endeavor to grow plants that are hardy to his zone. Generally speaking if we do not include the Northern areas of Pakistan/Mountains ranges Pakistan would fall between Zone 9a/b(Peshawar/Islamabad/adjoining areas) to Zone 12( Karachi). 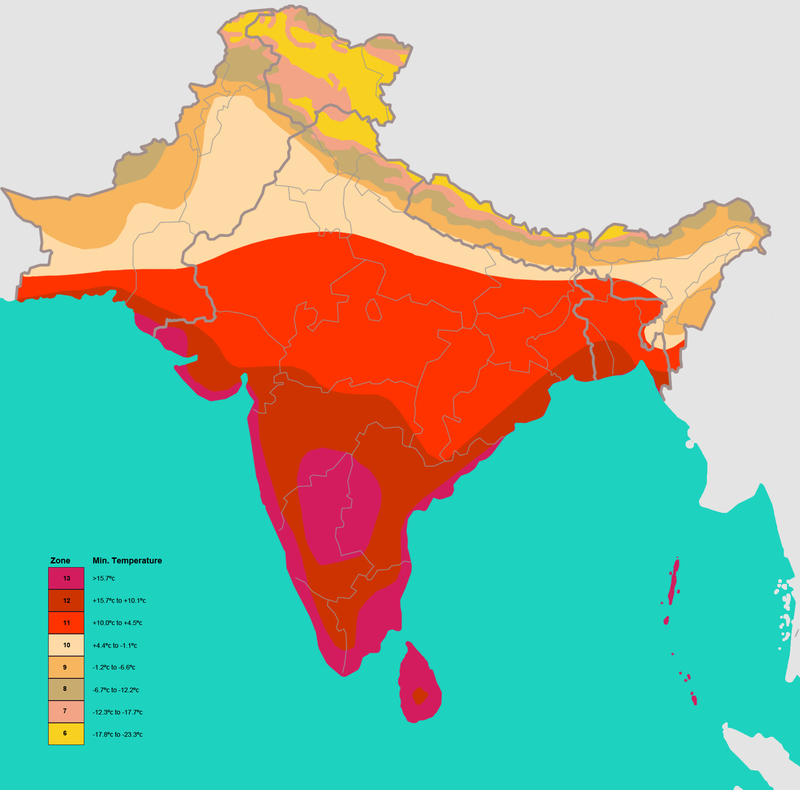 Below is the Hardiness Zone for Sub-Continent. The limitation of these hardiness zones is that they do not cater for Maximum temperatures. For Example certain tropical plant may be hardy to Zone-10, but as hardiness zone does not include maximum temperature, this plant will fail when temperatures exceed let’s say 40 Deg Celsius (and will require greenhouse/protection to overcome heat). This calls for Hardiness zone based on maximum temperatures. Work is in progress but no reliable hardiness zone based on maximum temperature is in place as yet. farhan137 wrote: Often when we are seeing plant profiles, we come across words like plant is hardy to Zone X. This information is useful in a sense that it tells us what minimum temperature/climate, a plant can tolerate. Therefore one must endeavor to grow plants that are hardy to his zone. Thanks for sharing the info. 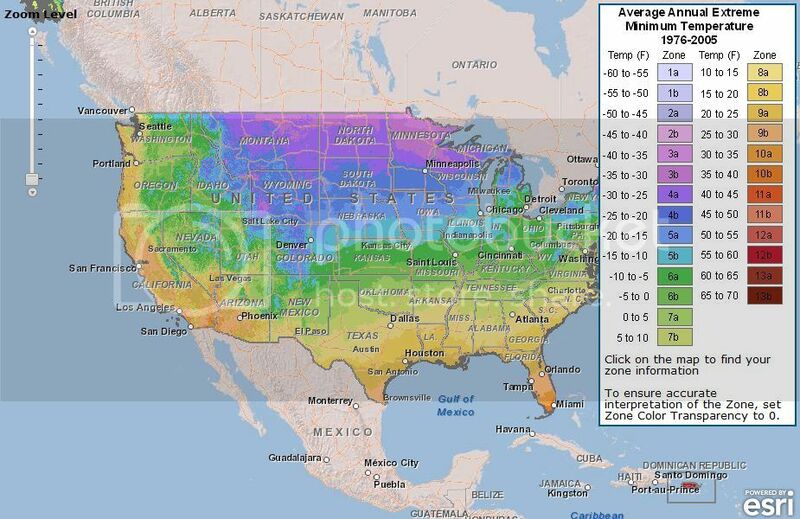 I am sure you you must have seen the American Horticultural Society Heat Zone maps that are based on heat tolerance- unfortunately the information is not free. "The 12 zones of the map indicate the average number of days each year that a given region experiences "heat days"-temperatures over 86 degrees (30 degrees Celsius). That is the point at which plants begin suffering physiological damage from heat. The zones range from Zone 1 (less than one heat day) to Zone 12 (more than 210 heat days)." _ Is area/citywise listing of Pakistan available? _ Any other features/implications of the Zones, besides temperature? _ Further implications of sub zones ie,9a/b;non-tech details, only if any of relevence to ordinary gardeners/farmers. @ Farooq sb...thanks for correcting me....But still heat zones are not generally as accepted as the cold hardiness zone. Secondly i think they don't cater for the Peak maximum temperature like cool hardy zones, correct me if wrong. I think model needs to be devised keeping in mind max temp also. @ Munir Sb.....Islamabad will generally fall in Zone 9b, you can see wiki page for further information on hardiness zones. Moreover you can correlate above map with normal map of Pakistan to find out hardiness zone of other cities. Above hardiness zone only cater for coldness, for other implications we need to study "Plant hardiness". Generally speaking we have three type of plants. Tender, Half hardy and hardy(Annuals/Perennials in all three categories). Hardy can generally withstand cold temperature down to its designated zone and can be planted out in situ/direct in garden without fear of frost(such as Pansy/calendula). Half hardy can survive cold but not frost, they are started indoor/sheltered location and can be planted out after frost(Snapdragon). Tender will die due coldness and should be started after last frost or they would require heated green house. Correct starting time of different annuals. Reduced growth/dormant period of plants. This is just layman information you cant consult web for detailed info. I would appreciate if Farhan can give the original reference of his info for Pakistan, since he shows a map too. In a formal sense the zone classification is officially done by the US Dept of Agriculture for of course US only (USDA Hardiness Zones). Some other developed countries have the hardniess well defined too. I don't know how much original work in Pakistan has been done to correlate the USDS numbers with our local climate and plants. I could not find any information for Pakistan from authentic databases. The hardiness zone we are talking about is winter hardiness. In lahore and other warm areas, we are concerned about summer heat and humidity which is the real killer. The heat zone map, while good, still does not solve the problem entirely. Take an example of a plant which can survive drought but rots in humidity. Now heat zone will not help in this case. The difference of day/night temp is also not covered in these maps. Though it is better than hardiness zone in my opinion. I think hardiness zone is only helpful for saving our plants in winter. It does not tell us whether this plant will grow good here or not. My personal observation is, if a plant grows good in arizona(semi desert dry heat) and florida(high humidity), then it grows good in lahore Davesgarden can be used to check for these states. @Khabbab........thanks for sharing places with similar climate so that we can correlate hardiness as well as plants with our climate. @ Farooq Bhai......This information is my point of view based on whatever information i have assimilated from different sources. The image is from source mentioned below. I would ratify my point of view on two considerations. Firstly, in absence of any direct information on hardiness zones of Pakistan, this is the only direct work, having no other model we have to rely on whatever is available.It would be true unless proven wrong. Secondly this image is nothing but simple mapping of minimum temperatures based on weather records, and meteorology being one of my specialized subject i can safely say this temperature map vis a vis cold hardiness zones are near correct. 2. I think Hardiness Zone for Sub-Continent is misleading because there is no concept of zone 12 & 13 in USDA. Also the source is not authentic. I guess Zone 12/13 are recently added as stated by USDA official website. Official image is shown below. Secondly, source may be unauthentic .......but its just simple mapping of minimum temperature which i think is not disputed.